Modern stoves are in most cases gas, wood or oil-fired boilers, supplemented by electric or gas stoves. 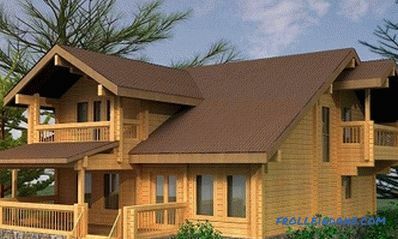 However, recently, due to the large financial opportunities and the expanded selection of high-quality building materials, many owners of country houses and summer houses are thinking about returning to the past - about building a beautiful, warm and cozy home stove. 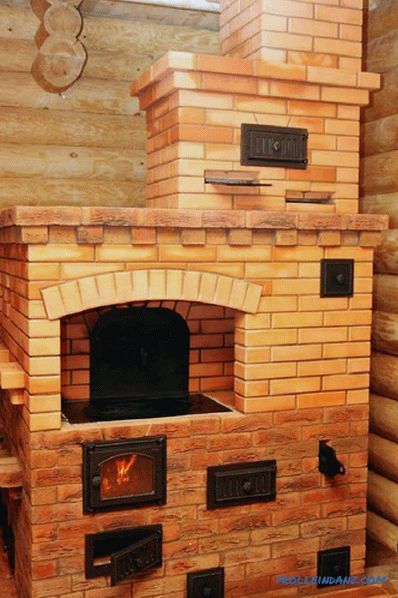 In this article we will explain how to lay the brick oven in the country itself (in a country house). Question "To be or not to be a furnace in your house?" It should be decided at the stage of designing your suburban housing. The fact is that the stove must have its own foundation, not connected with the foundation under the walls of the building. This is due to the fact that the stove weighs less than the walls of the house, on which the ceilings and the roof rest, and therefore their foundations will work differently. If the foundation of the furnace and the walls are combined, then distortions and cracks will arise in the structure. 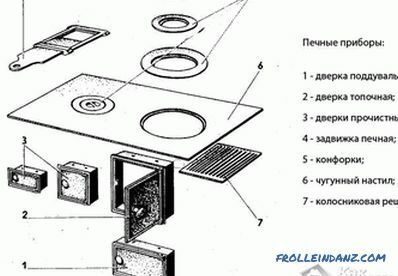 The second point that makes you think about the device of the furnace at the very beginning of construction works is the floor in the room where you are going to build the furnace. If the foundation under the furnace is not laid even before the start of work on the flooring, then these floors will have to be opened, the concrete screed must be broken, the foundation pit should be dug under the furnace foundation and only after its construction can the floors be restored. 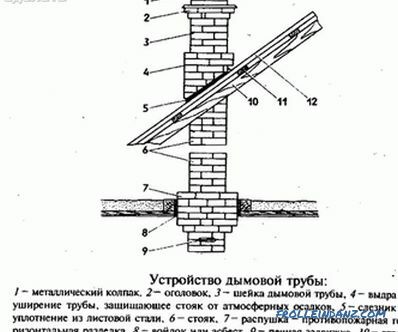 The third point that makes planning a place for the furnace in advance is the need to install a chimney, as well as to ensure that it can intersect the structures of the overlapping roof and the roof (it is not very pleasant to find out that you are "accidentally on your way” turned out to be a beam or truss foot). 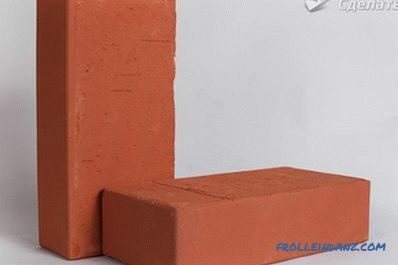 availability of the necessary material: clay th solid brick masonry furnaces, clay, sand, cement, etc.,.. 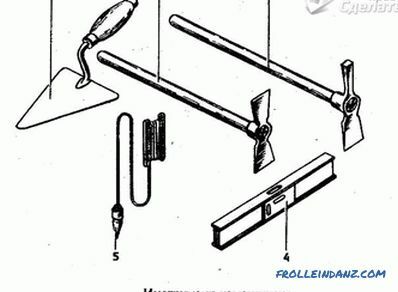 presence of an appropriate tool and performing masonry skills. 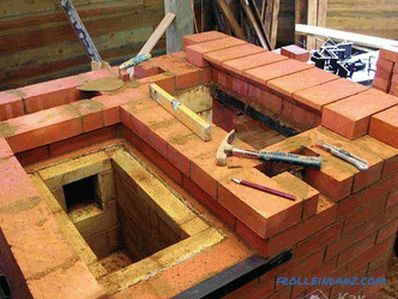 If you did not try to work with bricks before masonry , we advise you first to practice on laying out brick partitions, as it is impossible to fold a household oven with high quality and beautifully without work experience. Later, you will plaster all your “training” partitions anyway, and therefore, even if the seams are not very smooth, this will not be visible. 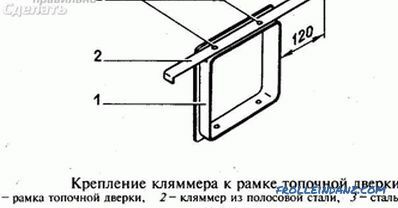 Having defined the appearance of the furnace, be sure to find in books or the Internet diagrams (working drawings) of the orderly placement of the furnace. Without these schemes to work can not begin. Complete the foundation for the furnace. The size of the foundation in the plan should exceed the size of the furnace by 50-100 mm on each side. The depth of the foundation should not be less than the depth of freezing of the soil, otherwise the frozen water will "lift" the foundation and make it unusable (along with your furnace). Be sure to tamp the bottom of the pit, then pour 10 cm of gravel or gravel (with its subsequent tamping), and only then proceed to the construction of the foundation: concrete with a frame made of reinforcement or rubble. The upper surface of the foundation should be approximately 14-15 cm below the level of the clean floor of the floor. 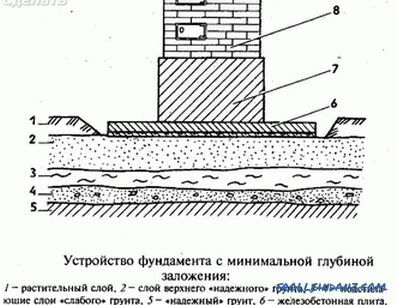 When buying a brick for laying a stove, note that when using coal as a fuel for such a stove, the firebox must be laid out of refractory bricks. 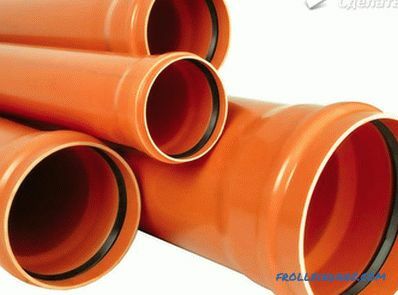 You will also need: ceramic brick, ordinary clay and refractory, sand ; grate; doors - furnace, blowing, clean; stove valve, steel strip and roofing, steel wire, sheet asbestos, roofing material (the amount of material depends on the size of the furnace). 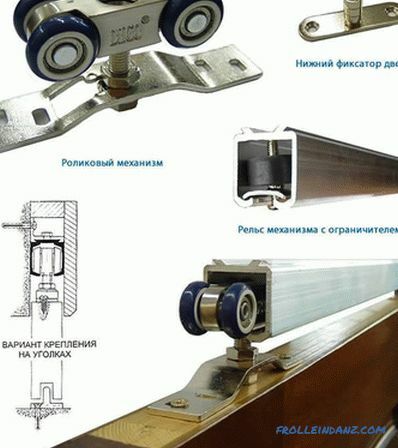 For cooking ovens with a heat cabinet (oven), additionally may be necessary: ​​a cast-iron stove with or without a burner, angular steel, a thermal chamber door made of angular steel, an oven, galvanized steel. Top foundation on a complex solution (clay, cement, sand) lay out one row of bricks. Check the horizontal surface. We put two layers of roofing material on the bricks. We lay out the second row of bricks on the solution (its surface must coincide with the level of the clean floor of the room). similarly lay out the next row, checking the verticality of the corners with a plumb and installing the corresponding doors in the masonry (fix them in the masonry using with clamps made of flat steel and wire, hiding it in the seams between bricks). Before blocking the furnace channel , be sure to clean it of the mortar and wipe it thoroughly with a wet rag on the wall (remove the mortar that has fallen on the bricks). 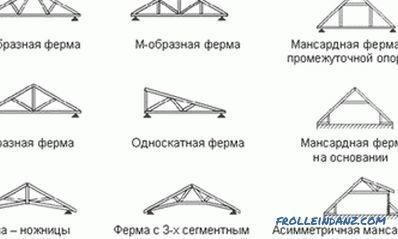 Proceed to laying the chimney on alumina-cement mortar. 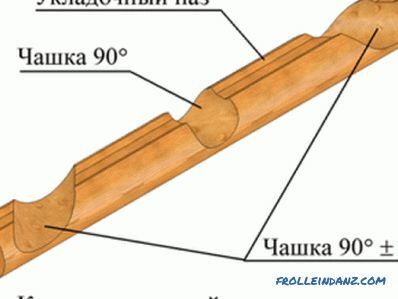 At the intersection of the pipe with the structure of the ceiling and the roof, be sure to perform fire fighting (thickening of the pipe). If you do not like the final appearance of the furnace, you can plaster it.